via Cures Not Wars, 9 Bleeker Street, Manhattan, N.Y. Pioneered the use of Ibogaine to treat heroin addiction, ultimately discovering its efficacy with treating that to alcohol, concentrated stimulants and even cigarettes, showing the governments' and their drug war really don't care about addiction, but rather a sustaining a criminal pharmaceutical-cigarette rackett. Howard Lotsof (March 1, 1943- 2010), discovered the anti-addictive effects of ibogaine in 1962. He was awarded a number of patents for the treatment of various chemical dependencies with ibogaine. The first of Lotsof's patents, issued in 1985, was US Patent 4,499,096, Rapid Method for Interrupting the Narcotic Addiction Syndrome. The last patent in the series for the use of ibogaine to treat chemical dependence was US Patent 5,152,994, Rapid Method for Interrupting or Attenuating Poly-Drug Dependency Syndromes, awarded October 6, 1992. Lotsof was active in promoting medical usage and further research of ibogaine and had an interest in chemical dependence patient advocacy including authoring theIbogaine Patients' Bill of Rights. Lotsof was a member of the Board of Directors of the National Alliance of Methadone Advocates and President of the Dora Weiner Foundation. 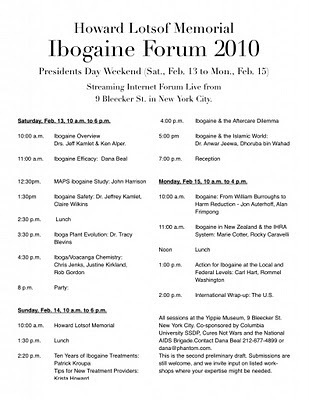 In March, 2009, Lotsof was honored for his discovery of ibogaine's antiaddictive effects during the Sayulita, Mexico ibogaine Provider and Facilitator conference. 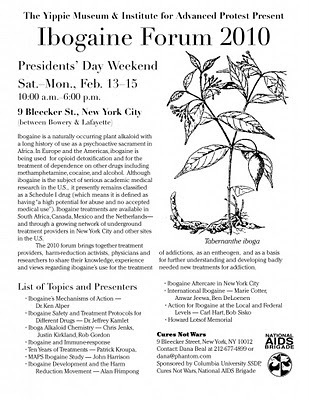 Fifty experts from around the world joined to present on ibogaine and associated subjects. Lotsof was born in the Bronx, New York to Abnor and Lillian Lotsof. He married Norma Alexander, the daughter of Robert and Marie Alexander in 1964, in Oakland, California. According to a notice at Myeboga, Howard passed away in a Staten Island University Hospital at 6 PM, January 31, 2010, with his wide Norma by his side.